Wedding season is in full swing here at Casa Martin. I sent off a trio of quilled invitations for a bride, her mother, and mother-in-law recently... such a nice idea that each will have one to display in her home as a reminder of the day. The modern scrolls design is a favorite of mine to quill and it was fun making three of the same, assembly-line style. The local frame shop where I purchase custom-cut mats just started carrying a line of a fabric-covered board with the sheen of fine silk. A light shade of gold married perfectly (ha, I can't resist a pun) with the raised gold lettering on pearlized card stock. While positioned in my usual warm weather spot on the sun porch last week while working on a marriage certificate (woodland theme in a lighter color palette for a summer solstice wedding), I noticed a pair of robins busily flitting past the windows as they built a nest in a nearby evergreen. That started me thinking of all the birds I've quilled at one time or another, and so I've gathered this little flock. If you like to quill too, perhaps the pics will give you ideas for spring projects. 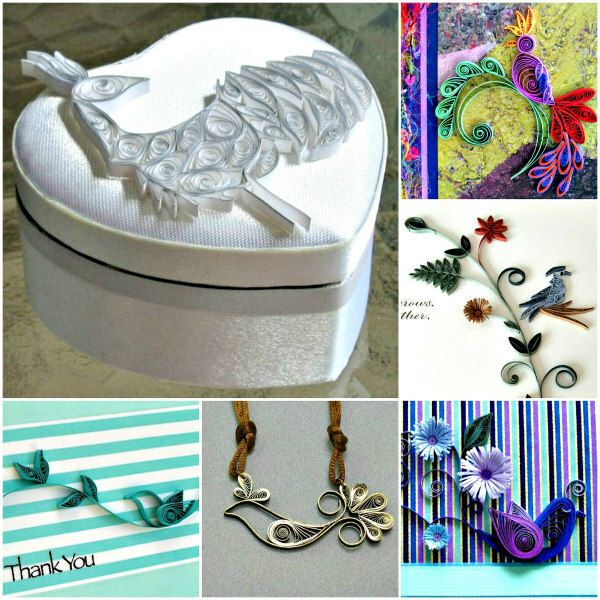 If you're brand new to paper rolling, you'll find lots of tips in my list of Quilling FAQ. 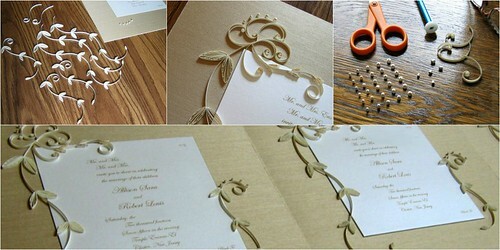 I really love your invitations! So refined and elegant! Made with a lot of patience! I have been drooling over just about everything... I want to learn how to do this real bad. Just got some paper for next to nothing at Goodwill, so will try something soon. You're welcome - have fun with your new supplies! You make it look so easy, but to match those 3 so well takes one with a practiced hand and even tension. Bravo! Aw thanks, Cecelia. Right you are... there's no way to get around the need to practice when it comes to quilling. Such gorgeous scrolls Ann. your tight coils can be mistaken for half pearls so perfect. Thanks Suganthi, I do love to make those tiny coils. I love those colors together, Kim, glad you do too!